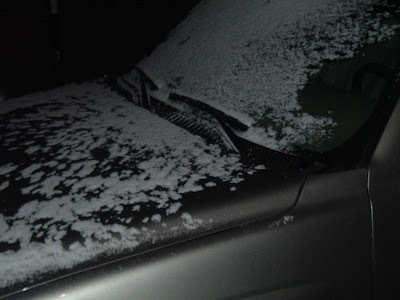 The Weather Guy: Snow Pictures From Cookeville, TN! Snow Pictures From Cookeville, TN! Here is a shot of snow on the Tahoe...it's blowing around quite nicely..can see it on the roads and in the yard. I'm sure there will be a few places where the roads may become slippery. Here is the back patio and snow on our table! Guess we won't be grilling out and eating on this table and chairs tonight!...BRRRRRRR...it's COLD! Stars are pretty bright out there now. Probably the last of the flakes has fallen. Mike, you will have to let me know if my guess for you for 1/2" was close, or was I off.